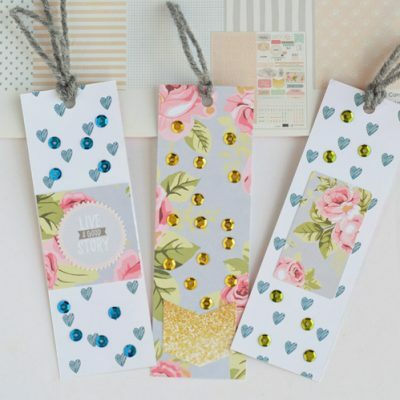 I’m doing some serious scrap busting this week for a baby shower. 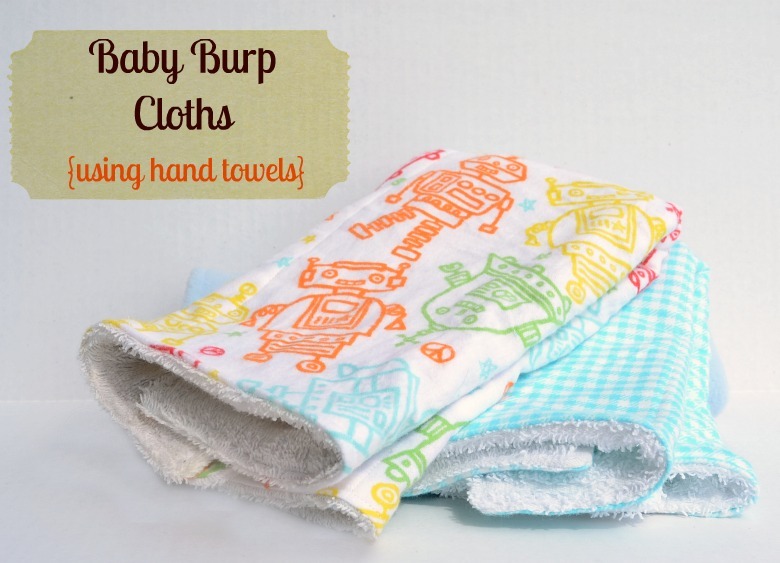 Today I’m making Baby Burp Cloths, using hand towels. When babies spit up, it’s usually completely gross and a disastrous mess. What better to clean up the catastrophe than a hand towel? Purchase the hand towels at the Dollar Store to save some serious money. I hope it is unnecessary for me to state this, but if you are giving these as a baby gift, please do not make them with your used, stained hand towels. Being by cutting out the 11″ by 17″ rectangle from the hand towel. 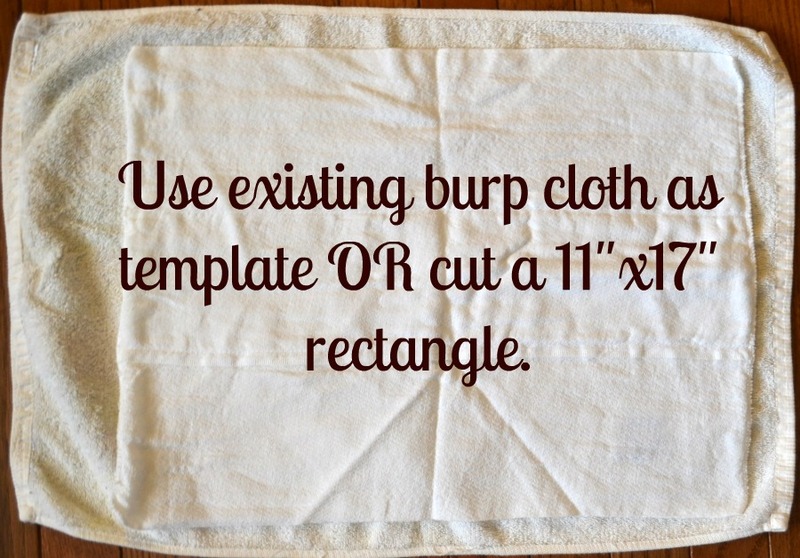 I used an old burp cloth as a template to get my dimensions. 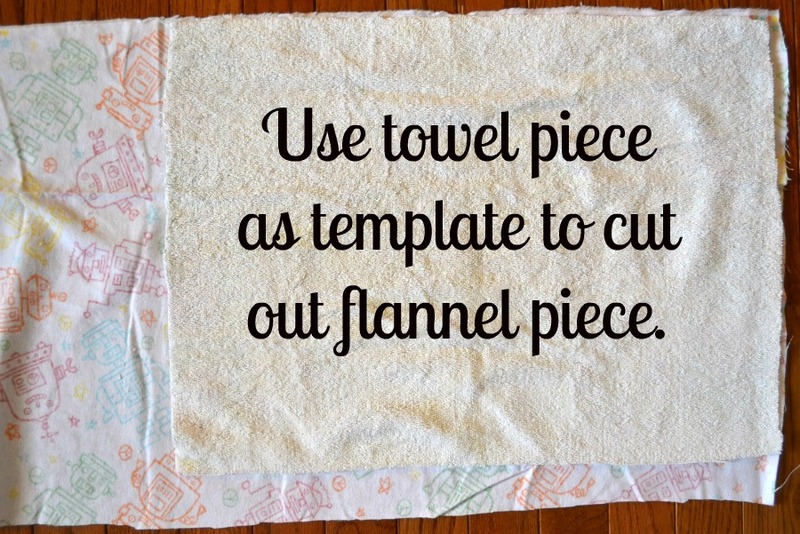 Use the cut hand towel portion to cut a matching rectangle of flannel. Place the hand towel and flannel piece right sides together. Pin and sew, using a 1/2″ seam allowance. Be sure to leave an opening of at least a few inches to turn. Clip the corners and trim seams. Turn right side out. Pin the opening closed, being sure the seam allowance is inwardly turned. 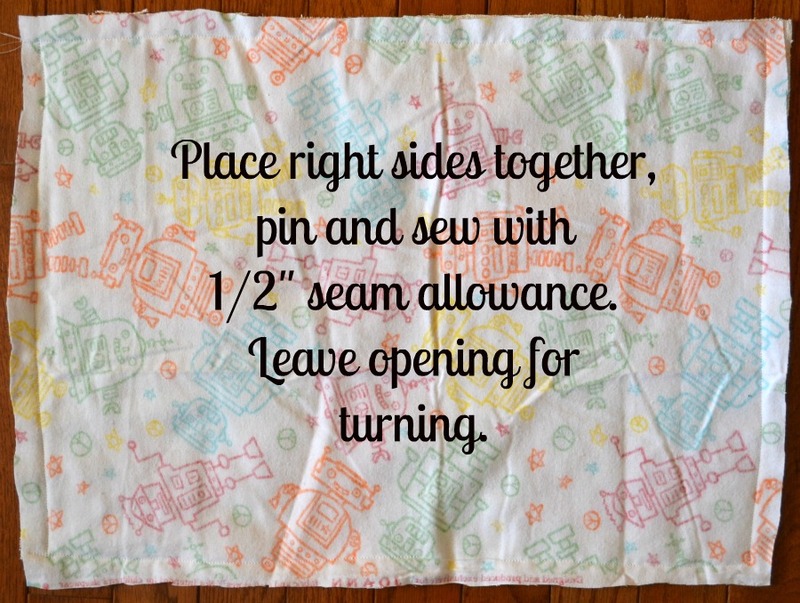 Sew around the perimeter of the burp cloth 1/4″ from the edge. 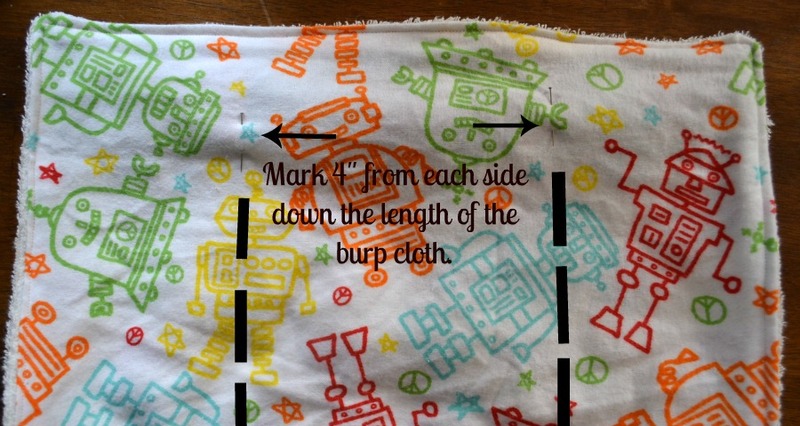 Mark 4″ from each edge of the burp cloth. Mark this all the way down the length of the cloth. Stitch two straight lines down the marked lines. 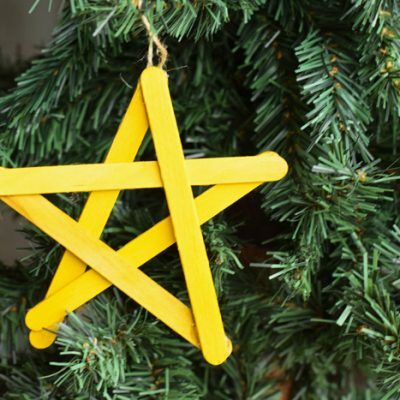 Super cute and so much more practical! The burp clothes from the store seem to just smear the stuff around. I love the idea of using a towel! I make mine the exact same way, but LOVE the idea of using towels!! 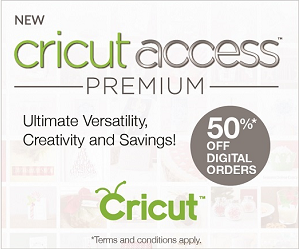 So much cheaper (and a great material to sop up all that spit up)! What a great use of hand towels! Great idea Melanie! Melanie, these are seriously adorable. And great work – I attempted burp cloths from towels a while back and my seams didn’t come out flat – your look fantastic. Great idea, I’m going to make some, thanks for sharing! What an awesome idea! 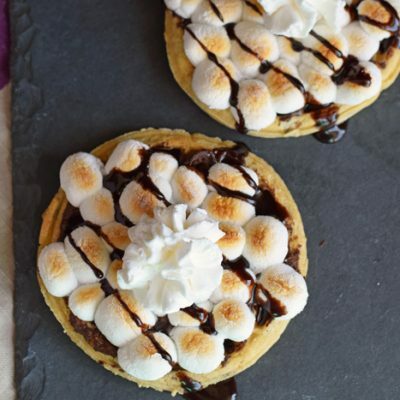 I have a friend who is pregnant with twins and I’ve been looking for ideas of what to make for her. These are great! 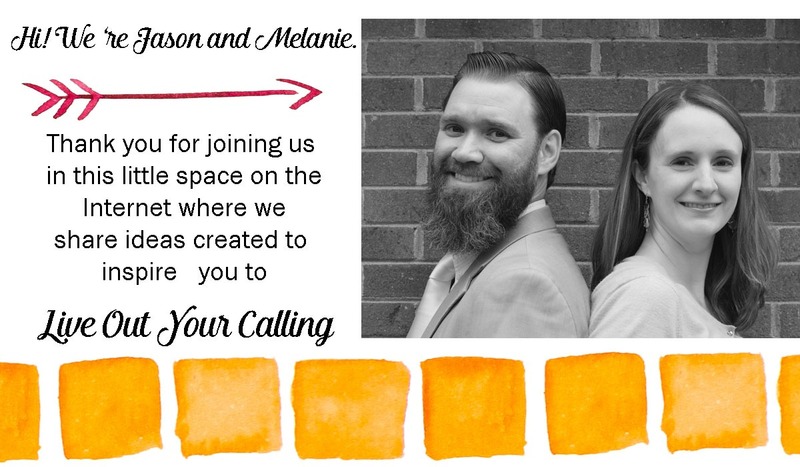 Found you via Petals to Picots Linky Party… now I’m off to have a little look around the rest of you blog. Again, love these! thanks so much for linking up! Super cute! My son was the king of spit up 🙁 most burp cloths didn’t even contain the mess completely. We definitely ended up using towels. My friend is having a baby in December, I think I might have to make her some of these. Diaper cloth and ripstop nylon are both on sale, I think only through today, and would be good protectors for the adult’s shoulders. Mine are adult now and we used totally different materials, but my son soaked through anything you tried to catch recycled formula. Maybe ripstop or something similar on one side or in between? Think I’ll watch towel sales and get some of that JoAnn’s fabric, Christmas is around the corner and babys are everywhere!! Great idea. Found you on Mad in Crafts. Great idea! Such a lovely simple, clear tutorial too! 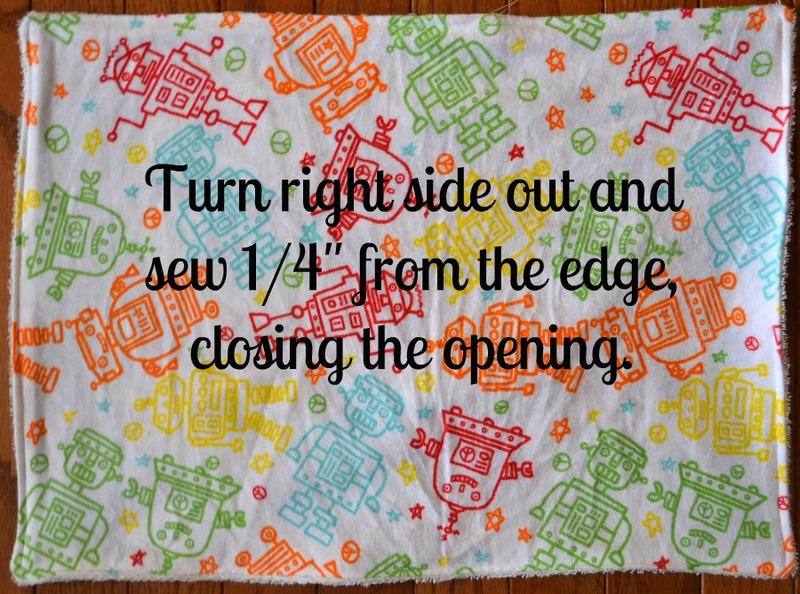 Do you think using a serger would look nice and then no need to turn or topstitch? just got a new serger looking for projects! 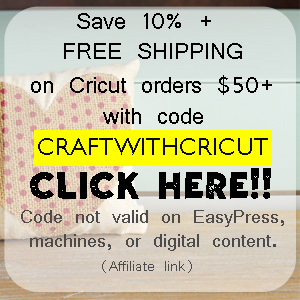 You could definitely use a serger. I still think that turning and topstitching will look more polished, especially if giving them as gifts. Buying towel material/terry cloth from Joann’s or hancocks would be cheaper than washcloths from the dollar store and it gives you more color options.